Learn how to make rum cheesecake recipe with the "real thing". This recipe is a specialty for all cheesecake lovers who like the flavor of rum. Rum makes a great flavoring for many dishes, especially desserts, cookies and cakes. Even before I could afford to purchase the “real thing”, I would buy the little bottle of rum flavoring at the grocery store. It works well if you don’t have the real alcohol; it did for me for many years. I use it every year at Christmas in one of my two favorite cookie recipes in the world. They may not have encountered the rum cheesecake recipe yet, but the love for the flavor of this alcohol quickly spread through the first original colonies here in North America. Because of the popularity for rum a distillery was set up to supply the great demand. Manufacturing rum became the most prosperous industry in the New England colonies. 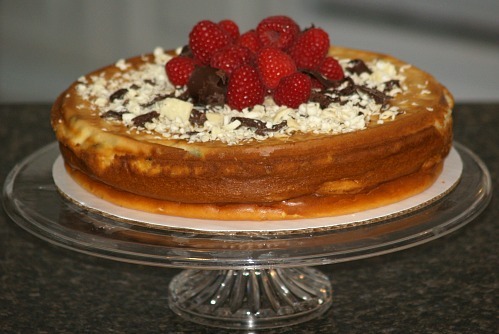 By learning how to make a rum cheesecake recipe, you can utilize many other ingredients to produce wonderful flavors. Raisins are one of the many fruits which blend well with the rum and also the creaminess of this great dessert. These “dried grapes” are wonderful eaten straight from the package or in all kinds of recipes. The delightful natural sweetness blends well with the rum and helps to enhance the combined flavors of all ingredients. In several countries “raisins” are only made from the large dark grapes. Here in the United States they may be smaller but the flavor is still abundant so use whatever kind you have. Chocolate is another ingredient that is delicious with rum. What couldn’t blend with chocolate? For that matter there is not much that couldn’t go with rum. Learn how to make a rum cheesecake recipe flavored with chocolate. Below you will find a delectable creamy chocolate cheesecake flavored with rum and resting on a great graham cracker crust. What could be better for us chocolate cheesecake lovers! You will also find below a great recipe combining butter and butterscotch with the rum. If you like the flavor of rum in a cheesecake you might also enjoy an Amaretto cheesecake, Baileys Cheesecake or the ultimate cheesecake which is made with raspberry Chambord. Combine 1 cup oats, ¼ cup nuts 3 tablespoons melted butter and 3 tablespoons brown sugar; blend. Press mixture in bottom of 9 inch spring form pan. Bake in preheated oven at 350F degrees for 15 minutes. Combine cream cheese, granulated sugar and 2 tablespoons flour; mix on medium speed until blended. Add eggs one at a time mixing well after each addition; blend in sour cream and rum. Cut 2 tablespoons butter into remaining flour and 1/3 cup brown sugar until resembling coarse crumbs. Stir raisins, ¼ cup nuts and 2 tablespoons oats into crumb mixture. Sprinkle mixture over cream cheese mixture. Bake at 350F degrees for 50 minutes. With knife loosen cake from rim of pan; cool at room temperature. Remove sides of pan; refrigerate until cold. 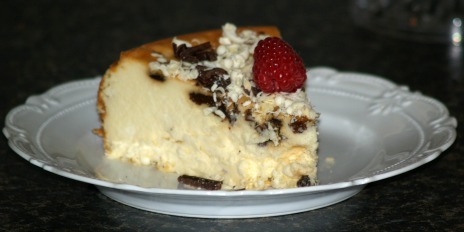 NOTE: The following rum cheesecake recipe is a little different from most other cheesecake recipes. First it is one of the easy no crust cheesecakes; just mix and pour into pan. The next point is that it is one that is baked in a larger pan of water to add more moistness to the cake. When this is done in baking a rum cheesecake recipe the preparation of the pan is important. Using the larger size aluminum foil, wrap bottom and sides of pan to prevent the water from leaking in to the bottom of the cheesecake making it soggy; most of the time the hot water will come up 1/3 to ½ on the sides of the pan. Note: If not baking in water a rum cheesecake recipe or any type of cheesecake in spring form pan, I prefer to set the pan on a sheet of foil or another shallow pan in the oven to prevent dripping in oven while baking. The third difference is that this rum cheesecake recipe includes arrowroot. You might ask what is arrowroot. Many recipes of all kinds will add a starch to help thicken and help set the recipe; cornstarch, flour or gelatin. Arrowroot is a starch also but will thicken at a lower temperature than flour or cornstarch. It is used in many recipes especially sauces in the Asian cuisine. Last this is one of the upside down cheesecake recipes. This is not totally unusual; just wait until completely cold before turning out on plate. I find it better to line the bottom of the pan with a piece of parchment paper; cut the circle to fit the pan. Soak raisins in rum for 15 minutes. Beat cream cheese and sugar until creamy; blend in arrowroot. Add eggs and yolks and mix until well blended; fold in heavy cream. Gently stir in raisins and rum mixture; pour batter into 10 inch prepared spring form pan. Set spring form pan in another pan on shelf of oven. Pour hot water in larger pan to come half way up sides of spring form pan. Bake in preheated oven at 325F degrees for 60 to 75 minutes or until appears set in center. Remove to cool before removing from pan. Turn upside down on plate to serve; garnish with whipped cream. I garnished with grated white and grated dark chocolate and a strawberry fan. Combine crumbs, melted butter and ¼ cup sugar together; press onto bottom and ¾ up sides of pan. Bake crust 6 to 8 minutes; cool. Melt butterscotch over hot water (not boiling) stirring until smooth; cool 30 minutes. Beat together cream cheese, ¼ cup sugar, salt and cooled butterscotch; blend until smooth. Add eggs beating on low just to combine (do not overbeat). Add sour cream, rum and cream; stir just to combine. Pour mixture into baked crust; bake for 45 minutes and cool 15 minutes. Run knife around pan to loosen cake from sides of pan; cool 30 minutes. Remove sides of pan; chill at least 5 hours. Melt chocolate pieces over very low heat; cool. Stir together crushed graham crackers, sugar and melted butter until blended. Press in bottom and 1 ½ inches up sides of a 10 inch spring form pan. Beat together cream cheese, 1 cup sugar, salt and melted chocolate on medium speed until blended. Pour into crust lined pan; place on shallow pan on oven rack. Bake 55 to 60 minutes or until center appears nearly set. Remove spring form pan from pan in oven to wire cooling rack; cool 15 minutes. Run knife around edge of pan to loosen cake from pan; cool 30 minutes longer. Remove sides of pan; cool 1 hour. Cover and chill at least 5 hours or overnight. Combine flour, egg yolks, ¼ cup sugar, salt and vanilla. Add ¼ cup butter and blend to make dough; wrap and chill 30 minutes. Roll dough out to fit bottom of 8 inch spring form pan; prick with fork and bake 20 minutes. Place raisins in pan with rum; bring to a boil, remove from heat, cover and set aside to cool. Push cottage cheese through a sieve into a bowl. Add to cheese softened ½ cup butter, ½ cup sugar and grated lemon rind; beat until blended. Add eggs to cheese mixture and blend; stir in cooled raisin mixture. Pour mixture into crusted pan and bake at 350F degrees for 70 minutes; cool in pan. Run knife around pan edge to loosen cake; remove sides of pan. Chill at least 5 hours or overnight. Preheat oven to 325F degrees; line bottom of 9X5 inch loaf pan with wax paper. Butter bottom paper and sides of pan; set aside. TO MAKE CRUST combine all crust ingredients. Press crumb mixture in bottom and 1 inch up sides of prepared pan. TO MAKE FILLING in a large bowl beat cream cheese and sugar until blended. On lowest speed of mixer beat in peel, juice, rum and vanilla. Beat in whipping cream and sour cream; pour into prepared pan. Place loaf pan in a larger shallow pan; pour boiling water 1 inch deep in larger pan. Bake until filling appears set in center when pan is shaken 75 to 90 minutes. Let cool on rack at least 4 hours; invert onto platter and peel off wax paper. Cover and refrigerate at least 5 hours; serves 12. TO MAKE CRUST combine all ingredients; blend well. Press in bottom and 1 ½ inches up sides of 9 inch spring form pan; chill. TO MAKE TOPPING combine sugar, flour, cinnamon and nutmeg in Dutch oven. Stir in rum and add apples; bring to a boil, cover and simmer for 15 minutes. Cook mixture just until apples are tender stirring occasionally. Remove from heat and stir in the pecans; cool to room temperature. SET ASIDE 3 tablespoons of the filling; refrigerate remaining topping for serving. TO MAKE FILLING combine cream cheese, eggs, sugar and vanilla in a large bowl. Beat cream cheese mixture until well blended; stir in reserved apple topping. Pour mixture in prepared crust; bake for 50 minutes then TURN OVEN OFF. NOTE: Leave cheesecake in oven with DOOR AJAR for 1 hour. Refrigerate cheesecake at least 4 hours. Run knife around edge to loosen sides; remove sides and top with apple topping.